Eugene Levy and Catherine O’Hara are one of the greatest comedic duos out there, and it’s been far too long since audiences have spent a sizeable amount of time with them. Luckily, the say-it-and-you’re-swearing new comedy Schitt’s Creek has been picked up as the very first original program to be aired on the upcoming network Pop, which will be taking over the TVGN brand. To celebrate, Pop has put out the series’ first trailer, and I don’t want to speak to soon or anything, but this could be amazing. Created by Eugene Levy and his son Daniel, Schitt’s Creek stars the former Levy as Johnny Rose, an extremely affluent video store magnate married to the blissfully ignorant soap opera star Moira (O’Hara). Their daughter Alexis (Annie Murphy) is a socialite and their son David (Daniel Levy) is a mega-hipster. The Roses’ lives are all changed for the much worse when the IRS (or whatever government faction) arrives to take away every part of their money-blowing lifestyle. It turns out the parents were involved in some kind of a Ponzi scheme that leaves them broke. The silver lining is a gag gift that Johnny bought for his son years previously: a small, no frills town called Schitt’s Creek. This family is now forced to get used to having their advanced lifestyle in the past as they live in a rundown motel as they try to figure out how to start over form square one. Things don’t look pretty, least of all the half-mullet sat atop the head of mayor Roland Schitt, played by the always excellent Chris Elliot. Also starring are Emily Hampshire, Jennifer Robertson, Sarah Levy and more. Check out the new still below, which perfectly juxtaposes the family’s past regality with their present worry. I admit the trailer doesn’t have the most genius punchlines to its jokes or anything, but this is a story rife with comedic potential, and these are the perfect actors to pull it off. I’m fairly certain O’Hara could play every character in this series without overlapping her talents. I love that Moira is completely oblivious to everything around her, including how many damn pearls are on her neck. I’m not familiar with Murphy’s work in the past, but she seems to be as game as everyone else, as does the younger Levy in his first starring role. I’d prefer not to get bogged down with the technicalities of “owning a town” and I’ll just hope that the show is as funny as its parts. Will it reach the lead duo’s apex of work on SCTV or the Christopher Guest movies? Probably not, but it’s got Chris Elliot! 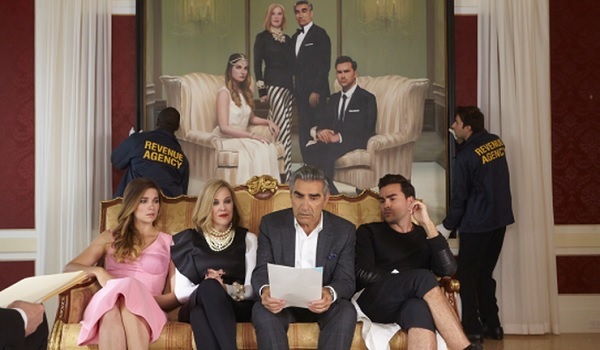 Expect to find Schitt’s Creek hitting the new Pop network in 2015. Check out the show's new Facebook page for more updates.